POTENZA S001 | Tong Seng Company Limited. Bridgestone has extended its sport tyre line-up with the launch of the Potenza S001 for top sports cars and high-powered luxury vehicles. Reliving the motor-sport heritage of Potenza tyres, the S001 is designed to give the world’s most powerful sports models even sportier handling and higher efficiency than the current Potenza RE050(A) it complements. With factory fitments on the Aston Martin Rapide and Ferrari 458 Italia, the Potenza S001 clearly meets the challenging demands of both heavier luxury sports cars and the new breed of lighter, extreme sport models. Block sipes are positioned a 60° angle, with the same effect as the nose of an F1 racing car. Block rigidity has been optimized, improving both traction and braking performance. Lateral grooves improve traction and braking. The combined with slick areas, reduces wear on the inside edge and guards against becoming unbalanced with the outside edge. With GUTT II Simulation the alignment, thickness and configuration of the straight grooves significantly reduce the risk of hydroplaning. The outside block, which takes most of the load when cornering, has been enlarged and reinforced to improve both wet and dry handling. 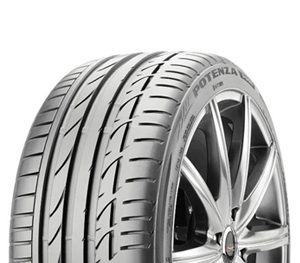 Reducing the Potenza RE050’s four main grooves down to three enables a larger block on the tyre’s outside edge. This, combined with the new “Multi-Performance Block” and “60° Slant Lug”, enables improved handling and braking performance in both wet and dry conditions. Potenza S001 is the designed tyre for factory installation on the biggest names in high-performance cars. This is testimony to the outstandingly superior performance and quality that its developers strived to achieve. Utilizing the Silent AC Block used in Turanza GR90, Potenza S001 is a sports tyre that is designed with noise reduction in mind. Strengthened casing imporves handling and ensures a ride that is as comfortable as it appropriately sporty for high performance cars.